Bi Shumin is one of the most unusual and powerful female writers in China's current literatary scene. She has created very influential works, writing almost 4 million words and has won more than 30 prizes both at home and abroad since the late 1980s. Amazingly, she Was able to move from medicine When she created her first works in 1987, she was already 35 years old. She joined the army when she was 16 and practiced medicine for 22 years. She is much like writers Lu Xun and Guo Moruo, who also gave up medical science for the pen. Bi Shumin's uncommon life experiences have given her works distinctive characteristics and endowed her with perspectives both as a writer and as a doctor. She also possesses unique insights that can grasp both mental and physical essence, courage, broad mindedness and merciful sentiments that are difficult for many writers, and a mission and responsibility that regards it as her own duty to heal the wounded and rescue the dead while curing sickness to save patients. From the very beginning her nature has been to be interested in other people, envisioning them as fascinating and mysterious. The nature of her writing is also to talk about people, about the connections between people and nature, and people and the universe. Literature is the study of people. When Bi was a high school student in Beijing -- just a little older than 16 -- she had to leave school and join the army. 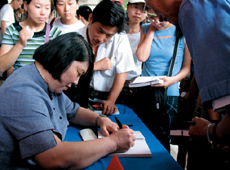 Writer Bi Shumin at a book signing of her latest workSave the Breast. Recalling her army experience in Tibet, Bi said, "I was sent to northern Tibet, maybe because I was in good health, and our unit was stationed at a juncture between a group of mountains at an elevation of 5,000 metres. To a 16-year-old girl, 35 years ago, it was an intense shock to be totally cut off from the world. It felt like Mars, like the earth had only recently solidified, without a scrap of human habitation." Bi stayed there for 11 years. "While I was there, Tibet's environment had a great influence on my future writing. At night you saw the stars -- they were enormous. During the day you saw the endless wilderness and you thought for a thousand years, for 10 thousand years, all this has been perfectly self-sufficient. A life of 100 years is insignificant to these mountains. I came away from this with the intense feeling that life is fleeting, and precious -- not only my own, but other peoples. "